Hydroelectric power. View along the dam wall of the Krasnoyarsk Dam built in 1956-72. The dam wall is 124 metres tall and 1065 metres wide and holds back a reservoir of over 70 cubic kilometres. This water is released through giant conduits and turn the blades of the turbines. At full capacity the power station produces about 6 GW (gigawatts) of energy, equivalent to a large coal-fired power station. Electricity from the power station is fed to local industries including an aluminium smelting plant. 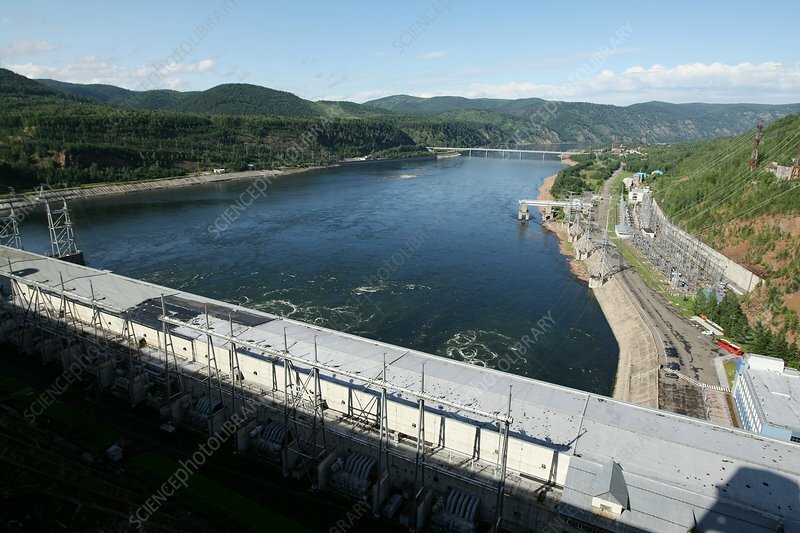 The dam is on the Yenisey River some 30km upstream from the city of Krasnoyarsk in Russia.